So...yeeeeeeeeeah...if you are trying to lose weight you may want to turn away from your screen right about now. These little bad boys are about to be your downfall. 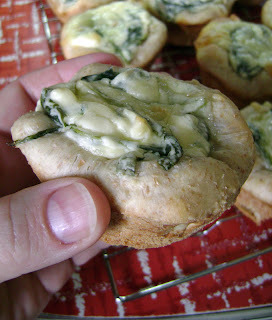 Ooey gooey cream cheesy spinach dip baked in a tiny bread bowl. No more having to dip into a communal bread bowl! No more trying to get just the right dip to bread ratio! Now you can pick up this little piece of perfection and enjoy. Preheat oven to 350 degrees F. Spray 12 muffin cups with non stick cooking spray. Unroll package of bread dough and slice into 12 equal size slices. Press each slice into about a 3 inch round. (I did this by pressing in between my hands.) Press into the bottom and up sides of the muffin cup. Set aside. 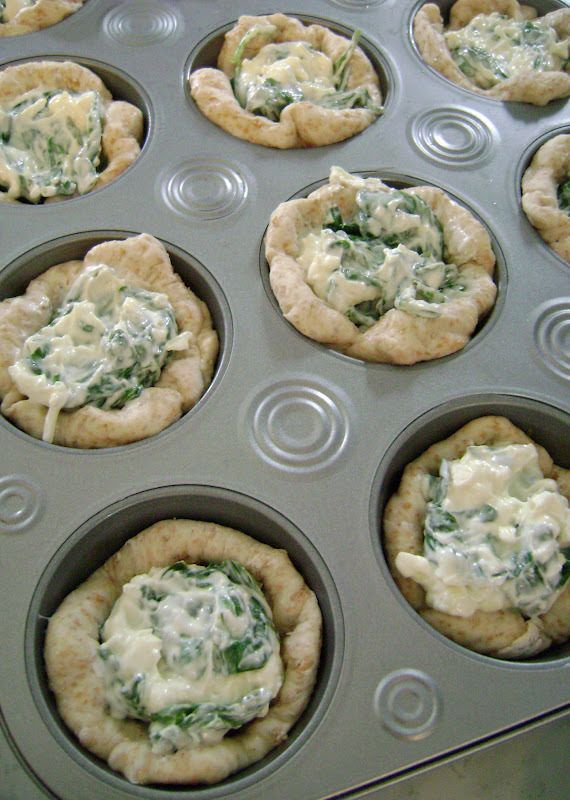 Bread bowls waiting to be filled. Spray a medium skillet with cooking spray, heat over medium heat. Cook and stir spinach until wilted, about 3 - 5 minutes then add garlic, cook and stir for another minute then turn heat off. Place cream cheese, sour cream, cooked spinach and garlic, Parmesan cheese, garlic salt, salt and pepper into a medium bowl. Mix until well combined. 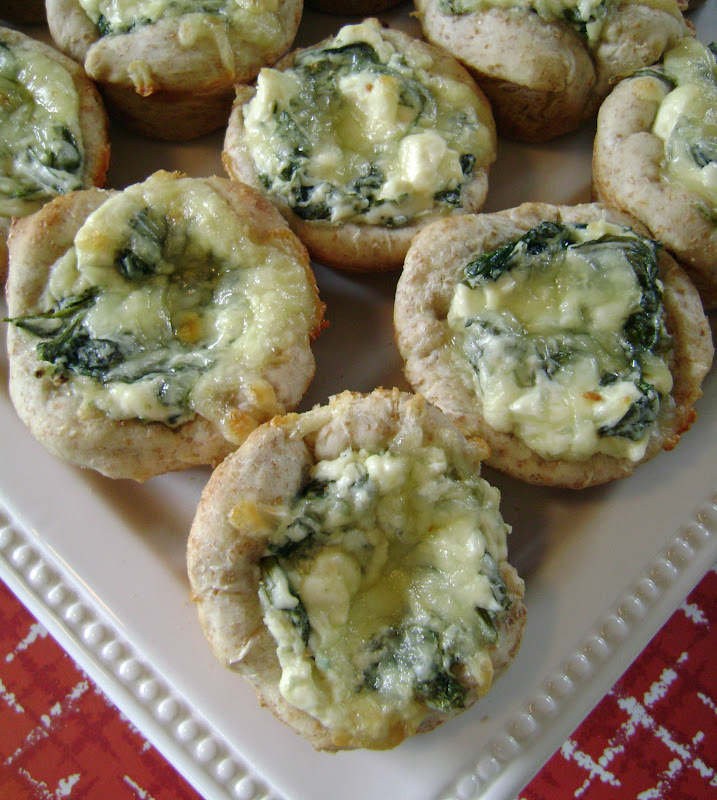 Scoop a Tbsp or 2 of dip into each of the centers of bread bowls. Waiting to go in the oven. 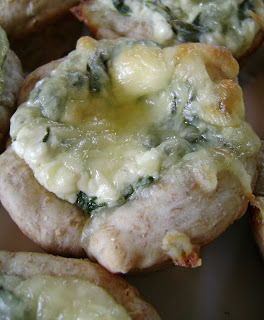 Top evenly with shredded cheese and bake for 15-20 minutes until just turning brown on edges. 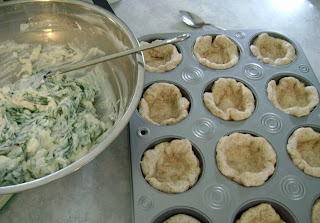 Remove and let cool for 3-5 minutes before removing from tin. Best served warm. Not exactly conducive to weight loss. Of course, it's not so bad if you only eat one.